A global telecoms company ingests 300 million customer records in < 1.5 minutes today. A mid-size firm handles 3.7 billion transactions annually. With Big Data analytics at the heart of all these systems-driving transformation, innovation and new customer insights-these projects include massive quantities of sensitive data that flow across multiple systems. Adding to the complexity of securing your data, these systems are spread across multiple data centers, on premise, and in the cloud. 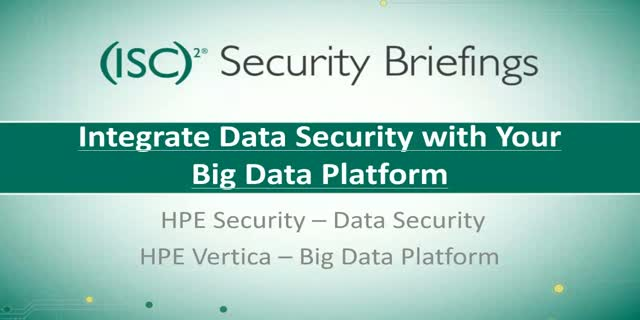 Join HPe Security - Data Security and (ISC)2 on July 19, 2016 at 1:00PM Eastern to understand how enterprises can leverage end-to-end data-centric protection in conjunction with their Big Data systems and view a technical deep dive into how enterprises can gain Big Data Insights - without the risk.